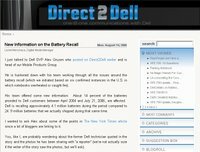 The latest news about Dell’s exploding laptop saga is not good – there is a front page piece in the NY Times today about their battery recall and the whole scenario is providing fuel for the "I told you so" crowd that fanned the flames of Dell Hell. A more interesting development, however, is how Dell is using the blog they quietly launched a few months back as a sounding board to offer their side of the story. Though the blog has not generated nearly as many links as the NY Times piece, it is a great example of a company learning from it’s earlier mistakes and trying to embrace personal media as a way to offer their (largely unreported) perspective. The fact that Dell now has a voice represents a valuable tool in managing this latest crisis. Now the challenge for Dell is finding a way to promote their voice (and blog) so it travels further. Assuming they are as dedicated to listening to their customers as language on the blog suggests, getting Dell customers to visit the blog and offer their honest feedback instead of simply vowing to avoid Dell in the future will be critical. Having a blog and participating in the blogosphere is a great first step. The only thing missing now is some smart blog marketing and promotion to build awareness their blog exists.